So today’s post is going to be a little different from normal. Instead of telling you about a future event, I’d like to talk about one that’s already past. Bear with me here, because this was one lecture nobody can afford to miss. 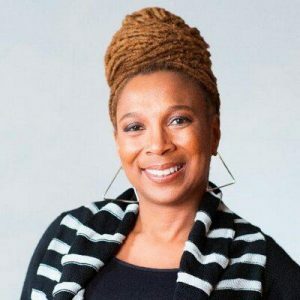 Last month, Kimberlé Crenshaw gave a lecture at Penn State – needless to say, it was incredible. 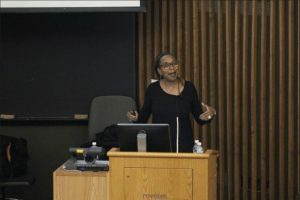 She argued that her term intersectionality, originally used in the context of black women seeking employment, is applicable in many situations today but is often misused by the media. 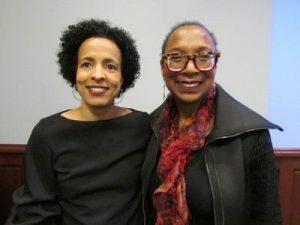 She explained that the word defines the people who “slip through the cracks” of social justice movements – she talked about Anita Hill, and how she fell short of racial equality movements because she was a woman, and was ignored by many feminists for being black. Crenshaw described the “cycle of invisibility,” and how it results in black women being excluded from programs like My Brother’s Keeper and other social justice efforts. Kimberlé Crenshaw’s lecture was not only powerful, but it made me think about intersectionality in a way I never had before. I never realized that I participated in intersectional erasure, and I was horrified to see how much black women are forgotten. I have always cared about civil rights and feminist movements, but it never occurred to me that black women were being excluded from those campaigns. I’m sure I am not the only one to be horrified by my own lack of action – if you’re reading this blog, I’m assuming it matters to you too. So what can we do to be proactive? Crenshaw gave us the answer. We need to raise our voices and call attention to intersectional erasure – we need to make it impossible for our society to ignore intersectional women. Write to activist organizations, talk to your friends and family; whatever you do, don’t let these women disappear. Just as a positive side note: The lecture, originally scheduled in Foster Auditorium, had to be moved to the Forum Building to accommodate the hundreds of people who came to see Kimberlé Crenshaw speak!